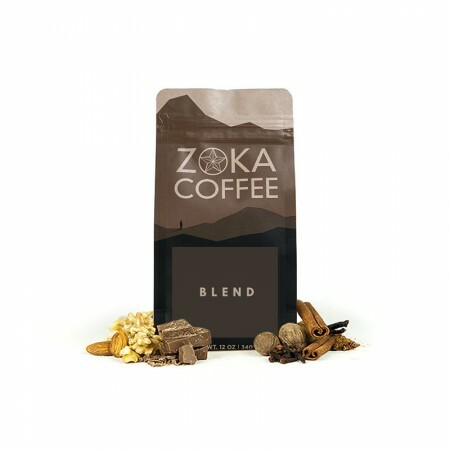 This is the Organic Espresso Cuatro brought to you by Zoka Coffee Roasting Co. This combination of Organic coffees from Africa and Latin America create a unique harmony of flavors that produce an syrupy, full bodied espresso. The cup is rich and comforting, with notes of chocolate, nuts and graham cracker. Brewed for a latte, I was not able to get any nuances out of this coffee. Flavor was traditional and a little flat. This coffee was definitely a good start. I can taste the chocolate flavor but it was missing caramel flavor. Love the full bodied taste! Very good, with a nice balanced complexity. Maybe a little on the mild side, could use a little sweetness to make it perfect. Very very good. Flavor descriptors are right on maybe with little berry. Has character without being too bright. Great selection. Rich and full. Needed a little more volume than usual to pull the right shot. Very particular with regards to pressure. Too much and it's brutal, too little and it's awful, but perfectly pressurized it is excellent. The Organic Espresso Cuatro from Zoka is a very mild espresso. It has a very light chocolate bitterness. But I don't find it sweet, or fruity. As a gibraltar, the flavor gets lost in the milk. Probably best served as straight espresso or a macchiato which I'll try next and update my review. Rich and smooth with perfectly subtle but distinct hints of graham cracker and chocolate. The perfect blend for our aeropress brewed cappuccinos. A superior coffee! We loved the bold flavor but easy-to-drink quality. Great esspresso blend. Full bodied, but smooth. Not a harsh flavor at all. Great to drink alone, with a little milk, or holds up to a latte as well. This is the best espresso I've had. Love it. This one was uneventful. Not bad, but it didn't leave me wanting more. I preferred this one as a shorter floral fruit shot. Espresso that had the chocolate graham cracker flavors was bitter. I did pick up nutty flavors when made into a cappuccino. Slightly underextracted, the shot ends up with a metallic aftertaste. Also picked up hints of herbal/ dried bamboo leaves. Can't say it was particularly comforting =/.